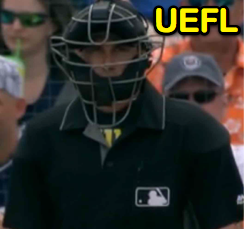 HP Umpire Brennan Miller ejected Tigers 1B Miguel Cabrera (strike three call; QOCU) in the bottom of the 6th inning of the Orioles-Tigers game. With two out and none on, Cabrera took a 0-2 pitch from Orioles pitcher Nate Karns for a called third strike. Replays indicate the pitch was located around the outer edge of home plate and approximately knee-high; StatCast is unavailable for this Spring Training game (there were no other callable pitches during the at-bat), the call was irrecusable. At the time of the ejection, the Orioles were leading, 6-0. The Orioles ultimately won the contest, 11-1. This is Brennan Miller (-)'s first ejection of Spring 2019. This is the second ejection of the 2019 preseason. This is the 1st player ejection of 2019 Spring. Prior to ejection, Cabrera was 1-3 (2 SO) in the contest. This is Detroit's 1st ejection of 2019 Spring, T-1st in the Grapefruit League (DET, HOU 1). This is Brennan Miller's first career MLB ejection. This is Miguel Cabrera's first ejection since August 24, 2017 (Carlos Torres; QOC = U [Fighting]).